West Palm Beach real estate features luxury condos for sale, bungalows and single family houses for sale in West Palm Beach's vibrant downtown and outlying areas. It's sunny palm-lined streets, scenic waterfront, shopping destinations, historic neighborhoods, year-round outdoor festivals and opulent lifestyle are the hallmarks of life in this vibrant waterfront city. View our West Palm Beach Real Estate Market Reports Here. West Palm Beach's Downtown is situated along the Intracoastal Waterway and is a hub of great dining, entertainment and retail options in addition to some amazing residential real estate options. Nightlife is concentrated in the Clematis Street Historic District, a part of downtown filled with bars and restaurants. 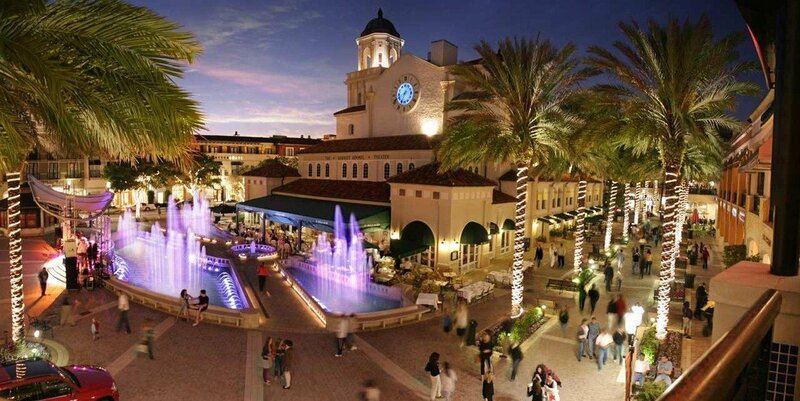 CityPlace, a few blocks south, is home to performance venues for culture hounds who want to catch an evening show, great dining at a host of local restaurants and upscale national chains and fantastic open-air shopping. The most common residential real estate is in the form of luxury high-rise condominiums for sale at several recently completed condominium communities and other more established buildings. A different real estate world exists outside of Downtown West Palm Beach; filled with family friendly communities, estate homes and more. If suburban West Palm Beach fits your style a little more, the real estate options are seemingly endless. West of I-95, you will find an entirely different side of the city. More suburban. Single-family houses for sale are more common west of I-95 and communities range from older and more established to new, master planned communities offering a country club lifestyle. The weather is usually picture perfect in West Palm Beach, FL. Enjoy the beautiful beaches and outdoor activities every day. Experience leisurely afternoons in City Place or just spend some time perusing the designer boutiques on world-famous Worth Avenue. With tons of attractions, activities, and adventures, West Palm Beach offers plenty to keep everyone busy, everyone happy and your life full of activity and adventure. Take a Drone Tour of West Palm Beach. Want to learn more about West Palm Beach Florida homes and property? Contact the experts at Lang Realty for help buying or selling West Palm Beach real estate. For a free consultation, call us at 877.357.0618 or use the contact form below.